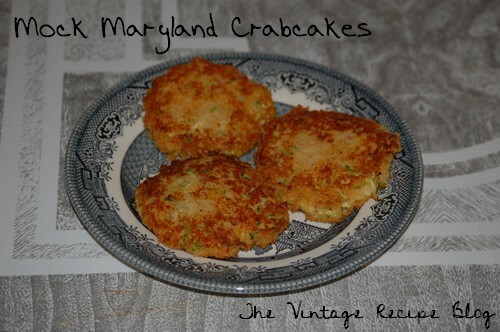 When times were tough and you couldn't afford to buy crab meat this neat little recipe stood in for the Authentic Crab Cake. They are delicious in their own right and would probably fool someone who wasn't a native Marylander but since I'm from Baltimore I can say they don't fool me. Don't let this dissuade you from trying them though as it's a great new way to use zucchini. You will have to shred the zucchini and place in a towel 1 cup and time. Fold the towel and make a ball squeezing very tightly to get out as much water as possible. If you skimp in this step your crabcakes will come out too damp. Squeeze water out of Zuccini then add flour and toss to coat well. Combine with all ingredients but bread crumbs. Form into 6 patties and coat with bread crumbs seasoned with 1/2tsp salt, 1/4tsp each of pepper and cayenne powder. Fry in large skillet with crisco until golden brown.